Last week, I attended the Independent Garden Center show in Chicago hoping to find 3 – 5 cool new products to review for 2011. I thought I had everything I needed when I left Thursday to stand in line for the elevator. Luckily, I ran into Jim Luurs, owner of Luurs Garden and Flower Shoppe (near the border between Hillside and Elmhurst, Illinois) so I had to ask, “What was the one cool thing that stood out so well you absolutely have to include it in your store?” Without hesitation Jim said, “Well, there is ONE really great thing and you’re gonna love it. Let me show you.” And with that, we walked to his truck where he had samples of what I gotta say is indeed a really nifty tool for creating raised beds without screws, bolts, drills, handymen or uncooperative husbands. 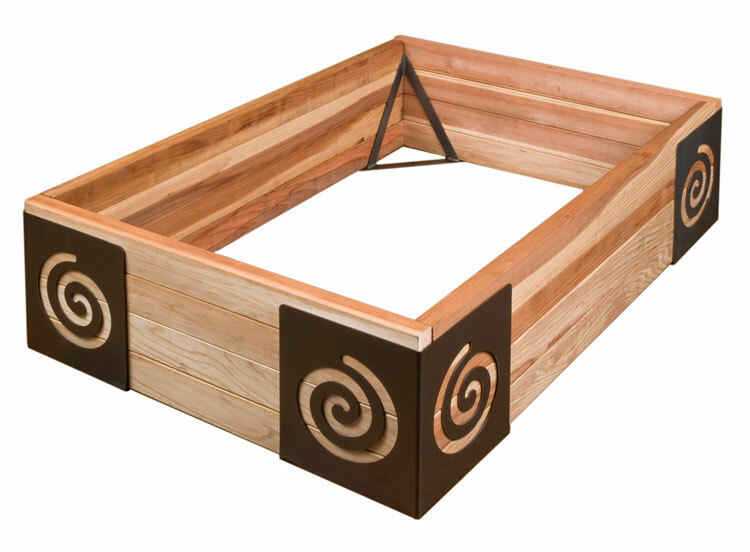 The M Brace: An artful corner tool to build a raised bed with pre-cut boards. Honestly, this is so nifty and artful and easy to use, you’ll wonder why it took so long to be invented. Just arrange your braces where you want the bed to be, plop in the wood, fill with dirt and plants. That’s it. You can even use recycled wood from old fences or barns for a weathered look. I’d like to see someone try using bamboo or other materials. And since the steel is 16 gauge, the brackets support almost any length of boards. Now I consider myself handy with a drill but honestly, I’d rather focus on the growing and less on the building so I think The M Brace is a nifty thing. The fact that it’s made in the USA from 100% recycled steel and will gather a groovy rusty surface over time, only adds to the artfulness of Jill’s designs. So of course, I just had to call Jill and learn more about how she came up with this idea and the responses she’s been getting. 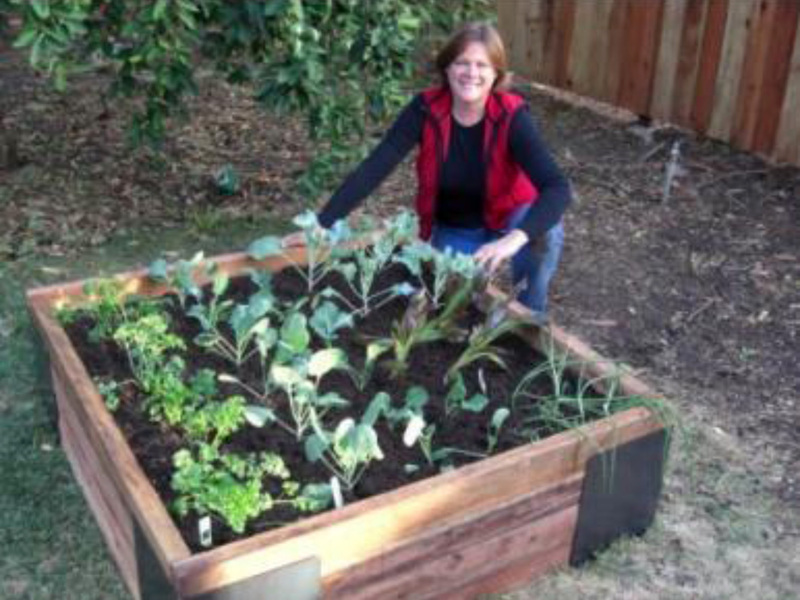 She got the idea in January 2009 while dealing with her own difficulties in building her raised garden beds. After struggling with the corners, she took a break to make dinner. When refilling her napkin holder while dinner was cooking, she had one of those knock on the side of the head moments where it all just connected. She immediately saw the correlation between a basic napkin holder and a new, amazingly easy way to build a raised bed without tools. Her background as a high school teacher was instrumental during product development. “You’ve got to know your stuff if you’re teaching teenagers, so research was the easy part for me,” Jill explained as we discussed all the product design and development tasks required to create The M Brace. The biggest challenge, according to Jill, has been the rapid manufacturing ramp up needed to meet the unbelievable demand. She didn’t think it would take off as quickly as it has; she expected to have 2 – 3 years to ramp up. But because of the fast ramp up, she’s also able to start bringing the prices down because she’s scaling up production so quickly to meet demand. Jill Plumb, former high school teacher, now local & eco-focused garden tool inventor. Even with the frantic ramp up, she’s passionate about keeping production local and environmentally friendly. “I won’t make these in China,” Jill said during our phone call. In fact, her factory is 15 minutes from home and she’s looking to add a midwestern plant to keep transportation costs as low as possible across the US. Eco ethics is such a passion, she wants to ensure that nothing she does “…will mess up the planet. It’s wonderful to produce something with recycled materials.” In fact, Jill is so passionate about local sourcing and gardening that her back yard is part of a local CSA. She’s also committed to using recycled materials. In fact, all the steel is 100% recycled; even the cutouts from the laser cut designs get recycled back into products like edgers and plant stakes. And the powder coating option, available through some retailers, is non-toxic and biodegradable. Jill said she feels very lucky to be able to make these choices herself on behalf of other gardeners who are just as passionate about our planet. Of course, the challenge with any new product these days will always include the local vs. overseas dilemma. While the bulk of Americans are hooked on cheap goods from sweatshops overseas, there’s an increasing awareness and concern that is starting to drive a local focus. Let’s hope Jill can continue to fend off the so-called business experts who want to see her produce these cheaper with questionable materials in China and a less local focus. For now, she’s a leading example of inventors/start up business owners who create a niche from their passions. Way to go Jill! Luurs Garden and Flower Shoppe, Hillside, Illinois is expected to be selling The M Brace in the near future. Just contact them for more info. There is also a list of retailers on Jill’s website but of course, this is expanding faster than they can update the site. So contact them if you’re not finding a retailer in your area. Now THAT is uber cool, Julia. I didn’t see those. I love it! How wonderful for her!! I hope the rumor is true! I love it! So many people I know would use and buy this! Let’s hope they start selling them in Canada!